Hours: 1:00 p.m. – 6:00 p.m.
- Yankee 1st Massachusetts Cavalry to camp and skirmish in the woods. - Faulkner Homestead kitchen and loom room are open for demonstrations. - Patriots’ Day marks the first day of the Revolutionary War and the first bloodshed of the Civil War. At the - Faulkner Homestead visitors can glimpse both eras. Step back into our local history and see women preparing meals to send to the Concord Fight in April 1775. Witness Francis Faulkner, Jr. and his horse as they dash off with food for the Acton minutemen. Colonial women will be minding their sheep and spinning and knitting garments for the menfolk off fighting the British regulars. Step into another century to cheer on Acton’s Civil War volunteers as they clash with Rebel troops, re-enacting a skirmish of the 1864 Battle of the Wilderness. Admission will be “pay what you will.” Iron Work Farm is grateful for the support of our sponsors: Middlesex Savings Bank, Erikson Grain Mill, Stonefield Farm, and Acton Funeral Home for making this event possible. 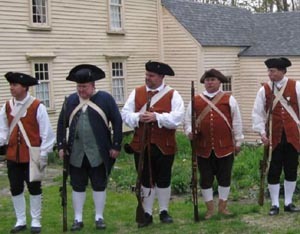 Looking for more Patriot's Day Events nearby? Visit our website for lots more and use the search term 'Patriot's Day'.